We are living in a digital society, in which every aspect of our lives is profoundly being affected by the digitalisation of data: how we communicate and socialise; how we work, learn, stay healthy and participate in politics and the economy. 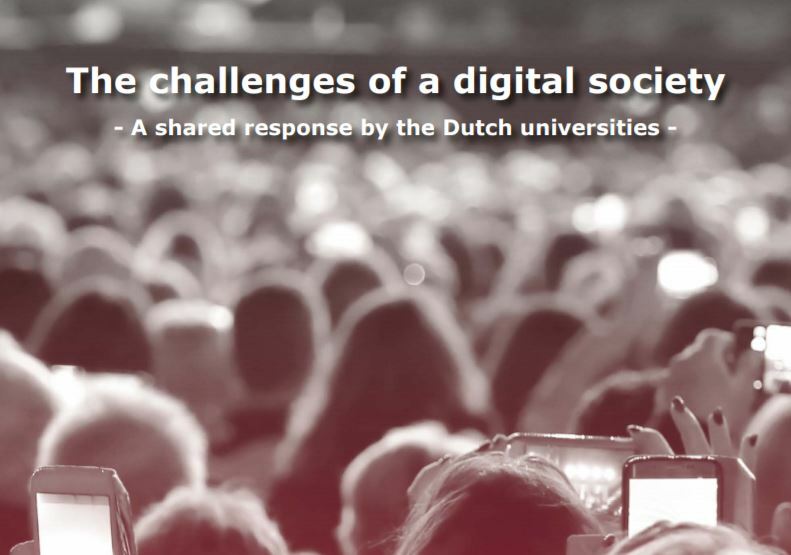 This special e-zine is published at the same day that the Dutch universities hold the first Digital Society Conference (27 November 2018). It is still early days as DiSa (DIgitale SAmenleving – Digital Society in Dutch) only started in the spring of 2018, and new researchers are just beginning to take up their posts. DiSa is a joint venture of the fourteen Dutch universities, each of which is investing in one or more of the seven programme lines. It is also an experiment as the VSNU has never before stimulated the universities to work together on a collaborative research agenda. Dutch universities benefit from an excellent digital infrastructure supporting education and research. The Netherlands has a long-standing culture of openness and collaboration, and is an active promoter of Open Science. Taken together, this means that researchers in the Netherlands are ideally positioned to take on a leadership role in multidisciplinary research for a human-centered digital society. New digital technologies are being developed very rapidly. Digitalisation and the associated growth of data are affecting all areas of human activity, including politics, work, the economy, and healthcare. Society is changing, sometimes for the better but certainly not always. Digital transformations are characterised by similar narratives of promises and fears, but they share complex questions of, for example, participation, responsibility, security, and surveillance. No single discipline can address all of the complex socio-technical questions arising from the further development and use of digital technologies and big data. This is why it is important for the universities to work together, across disciplinary boundaries, to develop a shared research agenda that addresses the interests of citizens, politicians, policy makers, and those working in government, civil society and industry. By engaging with a broad range of societal partners we can come up with research that puts societal needs central to further processes of digitalisation and that promotes responsible digitalisation and datafication with people at the centre. We would like to thank all of the contributors to the conference and the VSNU staff who have worked hard behind the scenes to create the conditions for our fruitful interactions. We hope you had an enjoyable and productive day at what we hope will be the first of many DiSa conferences. If you have feedback and ideas for future partnerships, collaborations and events, please share them with us.